Learn how to fix "The extended attributes are inconsistent" error while installing software/opening built-in programs in Windows 10/8.1/8/7, in this post. Opening programs such as Command Prompt, Registry Editor etc. After seeing this message for the very first time, definitely you’ll reboot with a hope that it will get solved automatically, but it will NOT! If you try to run System File Checker, you simply can’t because Command Prompt won’t open. Now if you’re thinking that reinstalling Windows will fix it, wait a minute. Try below mentioned fixes, and I’m sure you won’t need to reinstall then. 1. 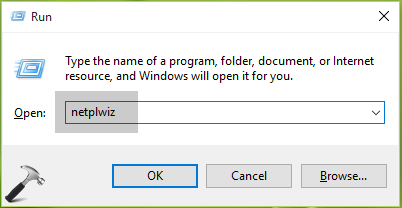 Press + R and put netplwiz in Run dialog box. Click OK or hit Enter key. 2. In the User Accounts window so appeared, select your user account and click Properties. 3. Next, in the property sheet, switch to Group Membership tab. Select Other and in the drop-down next to it, choose your account type such as Administrator, Users etc. Follow this process for each of the user account present on your system and make sure each account belongs to a particular group. Click Apply, OK and close User Accounts window, reboot then. After restart, you’ll find that the problem is resolved now. If not, go ahead with FIX 2. 1. Right click on sound icon in taskbar notification area and select Sounds. 2. Next, hit the drop-down against Sound Scheme and select Windows Default. Click Apply followed by OK. If you like, you may reboot and after that, the error should no longer appear. Sadly none of the before mentioned solutions work for me. Trying to open netplwiz.exe throws the same error. And changing the sound scheme to Windows Default also does nothing for the error. Any other ideas? Cuz I’m all out. thumbs up! thanks, fix 1 solved my issue. I tried the steps, still no luck. Now the error comes even after attempting to run netplwiz from the command prompt. Bizarre, but it worked. My audio was already set to Windows Default. I set it to “no sound” then back to default. Rebooted. All better! Neither fix one or two worked. System restore doesnt either. My situation was the same sort of error messages, but this is actually a virtual machine running within VirtualBox (v5.1.30) with a host OS of Linux Mint 18 and on a laptop that just has an integrated graphics chip. All of that just to qualify that this helped my situation, but might point someone else in the right direction. The immediate fix was to uncheck/disable the 3D graphics access from the virtual machine within the VirtualBox configuration. This was under “Settings –> Display –> Screen –> Enable 3D Acceleration” and it may indicate for others there could be a problem with graphics drivers/anticipation of a more full-featured 3D capable graphics card, or something to that effect. For me, I’m just turning it off and ignoring it because this is just for a little bit of development testing, not regular usage. Good luck out there. Unfortunately, it doesn’t work for me either.